The Robotic Joint Center at The Stone Clinic is an international destination for robotic-assisted joint replacement surgery for total and partial knee. Robot-assisted surgery uses a robotic system to aid a surgeon during a surgical procedure. In knee replacements, robotic-assisted surgery allows more precise alignment of the implants than conventional surgery. Kevin R. Stone, MD is one of the country’s most experienced outpatient MAKOplasty® surgeons. Dr. Stone has performed 4500 knee operations (both biologic and robotic-assisted) with the same surgical team and a significant number of partial knee replacements. He was one of the first surgeons to optimize outpatient robotic partial knee replacement. Follow up studies show a very high success rate since robotic surgery was commenced in 2012. Dr. Stone is consistently listed as one of the country’s top 25 Ambulatory Surgery Center (ASC) leaders and ranks amongst the country’s top 100 knee surgeons. 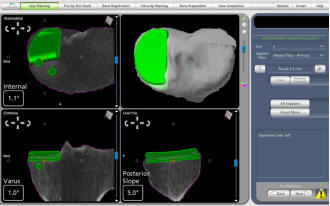 A CT scan of the patient's knee is entered into a software program that creates a 3-D replica of the patient’s knee. Before surgery, the surgeon and software technician work with the software program to plan the placement of the partial knee replacement. In the operating room, the combination of a robotic arm an​d computer navigation provides the surgeon with real-time visual, tactile, and auditory feedback enabling consistently reproducible precision and optimal positioning of the implant within the knee. It is this level of pinpoint precision and accuracy that facilitates optimal implant positioning and alignment to result in a more natural knee motion following surgery. A partial, or unicondylar, joint replacement resurfaces only the worn out portion of the joint, either the inside, outside or kneecap, leaving the rest of the joint alone. WIth new techniques for computerized patient specific and robotic surgery in addition to novel types of pain control we now perform our partial and total knee replacements as an outpatient at our specialized surgery center whenever possible. 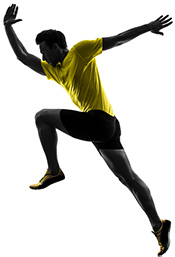 Our skilled onsite physical therapists have developed meticulous partial and total knee rehab protocols and work with patients to get them back to an active lifestyle as quickly as possible. Dr. Stone partners with the Aviva Centers of Surgical Excellence to perform robotic-assisted procedures. The San Francisco Surgery Center is a state of the art facility for outpatient procedures only. It is a far superior experience to a hospital; the care is more efficient and personalized. Infection rates are reduced. Patients from across the United States and around the world come to the Robotic Joint Center at The Stone Clinic in San Francisco to have their knees repaired by Dr. Stone. To find out if a robotic-assisted partial or total knee replacement is right for you, please schedule a complimentary consultation. Our concierge service is run by a patient coordinator who provides an extremely high level of guidance and support from the moment you call the clinic to the day you achieve your goals. Travel, accommodation and more.